Have you ever been to the Grand Canyon? How about the Rocky Mountains or the Great Lakes? God has given America many blessings, including the beauty of the land and a government that allows us to be freefree to talk about our feelings and ideas, free to live and work where we want, free to go to church and school and play with our friends.But there is another blessing that God wants to give usa freedom that's not just for people who live in America, but for everyone in the whole world. The Bible says, "For God so loved the world, that He gave His only Son, that whoever believes in Him should not perish but have eternal life" (John 3:16).God wants us to experience the best freedom of allliving forever with Him in Heaven. But our sinsthe bad things we doseparate us from God. So He sent His Son, Jesus, to take away our sins by dying on a cross. Three days later He rose to life again and now He lives in Heaven.If you are sorry for your sins and believe what Jesus did for you, you can accept God's freedom by praying: Dear God, I'm sorry for the bad things I've done. Thank You for sending Jesus to take away my sins. Please come into my life and help me live for You. Amen. 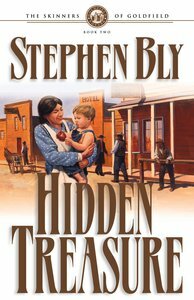 About "Hidden Treasure (#02 in Skinners Of Goldfield Series)"
Stephen Bly has authored over 95 books and hundreds of articles. His book, The Long Trail Home, won the prestigious 2002 Christy Award for excellence in Christian fiction in the category 'western novel'. Three other books, Picture Rock, The Outlaw's Sister, and Last of the Texas Camp were Christy Award finalists. - Publisher.